During the eighteenth century the art of decorated Esther scrolls reached its height in the ghettos of Italy, where wealthy families commissioned skilled craftsmen to create richly illuminated manuscripts and fine silver cases. 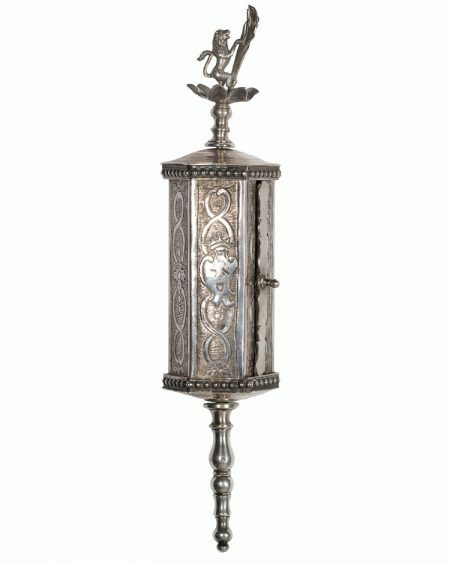 This suite of an Esther scroll, case, and box is unusual in that the individual elements of this set of ceremonial objects, commissioned by a patron in eighteenth-century Rome, have been preserved together. It is unusual for such objects to have been maintained as a unified group. The text of the scroll, written in forty-two columns, is arranged so that each line is unusually short, with only five to six words. Each text column is set in a rectangular frame painted in gold over a greenish undercoat. 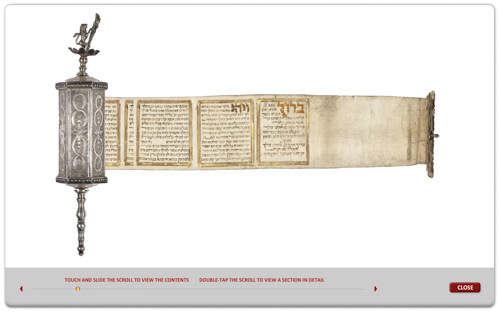 The opening words of the benedictions and of the book of Esther are written in large ornamental gold script. is ornamented with engraved intertwined scroll patterns and floral motifs, and with granulation on the upper and lower sections. It bears city and maker hallmarks for 1778–1780, which is also the approximate date of the scroll. The box that houses the case and scroll is the simplest object in the suite, but it is also the rarest element in the group. Made of wooden panels covered with tooled leather, it is fastened with two clasps. Such original boxes rarely survive with their Esther scrolls and cases. This box matches exactly the dimensions of the silver case. The silver case is engraved with the Hebrew characters alef, resh, samekh, probably the initials of the patron and owner. The rampant lion at the top of the case refers to a family crest; several Jewish families in Rome are known to have used similar devices. Because the family surname, based on the engraved Hebrew monogram, appears to have begun with a samekh, this heraldic emblem can be associated with the Di Segni or Scazzocchio families. Furman 1997, pp. 210–211; Sotheby’s New York 2000, lot 90.